Which Is the Best Rheem Tankless Water Heater? Among the popular water heater brands is Rheem, which is considered by many as the leader in the industry. A quick search online will give you information about the lines of appliances from this brand, including Rheem tankless water heater reviews. However, just like with everything else in the Internet, it is easy to get overwhelmed by the search results that come up. Hopefully, this article will help you understand better about the specific products we will talk about as we try to simplify the important points for consideration. Firstly, why do we have to look into water heaters? Many of us do not realize just how important water heaters are in our homes. They effortlessly and efficiently provide us with the much-needed hot water that we use for showering, cooking, laundry, and more. Unfortunately, one of the downsides of traditional water heaters is their bulky (and quite honestly ugly) appearance. That is why many homeowners these days consider water heater replacement, specifically to the tankless types. As mentioned, there are many information online about the best tankless water heater. And so for this particular article, we will try to narrow down your choices by collating Rheem hot water heater reviews. Read carefully below, then ask around about the specific water heaters we will be mentioning, and seriously consider which one suits you and your household’s specific needs the most. The above are all excellent water heaters, but they offer varying specifications depending on the different needs of the market. ﻿﻿Should You Make the Switch? 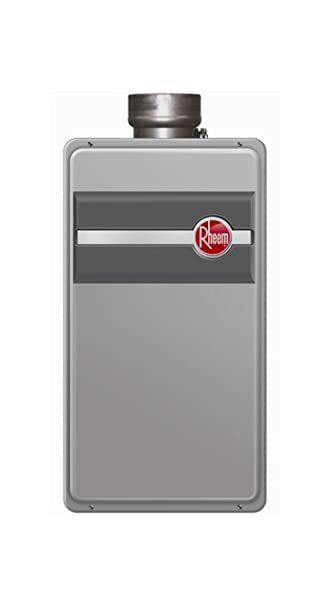 The Rheem RTGH-95DVLN water heater weighs 79 lbs (around 35.8 kg) and has a dimension of 18.5 x 9.8 x 27.5 inches. This unit comes with a two-pipe direct system especially designed for PVC pipe. Its special features include a self-diagnostic system that allows for easy installation—a plus for homeowners who are thinking of installing a water heater themselves. It comes with a digital display for easy monitoring and a freeze protection feature of up to -30 Fahrenheit and has a high-altitude capability of up to 8,400 ft above sea level. Perhaps one of the more important features for this unit is the Maintenance Notice Setting that alerts you when in need of service check. It comes with a digital remote control as well. Now what about the performance? This model comes with a water savings setting. This decreases the water flow through the pipes as you wait for the water to reach its desired temperature, allowing you to save up to 1100 gallons of water in a year. But more than that—this water heater by Rheem is among the most powerful of its kind. Other online Rheem tankless water heater reviews attest to this heater’s capacity to heat up to three high-flowing showers at the same time. This is thanks to its very high flow rate of up to 9.5 gallons per minute. You are guaranteed to have a steady supply of hot water even during times of peak usage. And because this is a condensing unit—you get to enjoy its incredible functionality without the high energy cost. Its efficiency can range from 90 to 98 percent, compared to non-condensing units with a maximum efficiency of just 80 percent. Overall, this unit is efficient and can quickly deliver hot water, even during colder climates. Another plus is that it is relatively quiet—meaning you can have this heater running without the distracting noise. The downside with this unit, however, is the price. It is essentially pricier than other units, which may be an issue for households not looking to spend much on a new water heater. Servicing of the unit may also pose as an issue for some homeowners since the warranty does not cover labor, just like other tankless water heaters. However, if price is not an issue for you and your household needs a very powerful water heater—then this Rheem is definitely for you, without a doubt. It comes with a self-diagnostic system for easy installation. It also comes with the Maintenance Notice Setting that alerts you when service check is needed. It is very efficient and powerful, with the ability to supply up to 9.5 gallons of water per minute. It is a condensing unit, making it very energy efficient. This unit is pricier compared to other models. Servicing may also be costly. This Rheem water heater weighs 54 lbs (around 24.4 kg) and has dimensions of 14 x 10 x 26 inches. Its weight allows you to easily lift it off the floor and stick it to strong enough walls. This water heater is excellent for homeowners buying a tankless heater for the first time since a natural gas unit is a great choice. In general, natural gas units are quite similar to traditional tank water heating systems. They also last longer and are stronger compared to electric types. This particular Rheem unit can offer up to 6.4 gallons per minute, enough to supply hot water to multiple showers and sinks at the same time. Its simultaneous usage feature is a big plus, especially if you live in a bigger household or if you need high-flowing hot water supply. While it does not match the Rheem RTGH-95DVLN model’s 9.5 GPM, 6.4 GPM is a good enough amount of hot water flow. Other Rheem tankless water heater reviews will let you know that this particular unit has similar features as the other Rheem units. However, the RTG-64XLN unit differs in the way it pumps emissions as it is a methane unit. Thanks to this unit’s “low NOx” function, you do not need to install very complicated venting systems. Instead, you can make use of the cheaper PVC type, allowing you to save on installation costs. Speaking of installation, Rheem has consistently made it easy for homeowners to install their water heaters by sending in the needed wires and remote control needed to help you set up. The remote control also lets you adjust the temperature easily. Depending on how you see it, one consideration for this particular water heater is its outdoor installation. This particular unit needs to be installed outside because placing it in an enclosed space may pose health risks due to the accumulation of fumes. The above consideration may be an issue for some, while others may see this as a welcome feature. After all, outdoor installation lets you save much-needed indoor space. Another downside for this particular unit is the flow rate during colder seasons. It requires double-time to heat taps during cold weathers, possibly slowing down the flow rate to 3 to 4 GPM. Overall, this Rheem model is a good enough water heater, especially for households in need of low to moderate hot water supply. It can be installed easily and comes with useful added features. Its “low NOx” feature helps reduce harmful emissions. This allows for “simultaneous usage,” providing hot water to several showers and kitchens at the same time. This Rheem unit is relatively cheaper compared to other models. It has to be installed outdoors. Its flow rate can be affected by the weather. It is not as powerful as other units and may therefore not be suitable for bigger homes or buildings. The last Rheem water heater we will look into in this article is the Rheem RTE 13 electric tankless water heater, which is popular for its compact design. It weighs just 7.3 lbs (3.3 kg) and has dimensions of 7.2 x 7.2 x 7.2 inches (yep, it is indeed small). The use of space is obviously one of the issues that come with water heater installation. This very reason is why many homeowners opt to have their traditional water heaters replaced with the tankless types. However, the absence of the bulky tank is not a guarantee that it will not take up space since some tankless units are bigger than the others. This makes the Rheem RTE 13 model an excellent choice for many homeowners. Its compact size allows for easy installation and helps you save up more space. You can easily pair it with other appliances at home such as your bathroom sink, dishwasher, and kitchen sink. This model is especially ideal for point-of-use applications. Meaning, it heats up your water when you need it especially when paired with a specific appliance. It does not store water, and it provides you your needed hot water instantly. Furthermore, it helps you save electricity because it stops using energy when the appliance is turned off. Because this water heater can provide up to 4 gallons of water per minute (a lot lower than the other two models discussed above), it is ideal for single shower applications. However, it can still be connected to up to two appliances like your shower and kitchen sink. The temperature adjustment dial allows you to easily set the heater to the desired temperature. And the LED lights lets you know whether it is on active or standby mode. Amazon reviewers give this product 4 to 5 stars, letting us know that past and present users have found this particular unit very impressive. However, it does come with some drawbacks. For one, it supplies lower amount of hot water so it may not be recommended for bigger households. Also, other Rheem tankless water heater reviews would tell us that the installation of this particular unit requires some other parts not included in the package. This may then add to the tankless water heater installation cost. 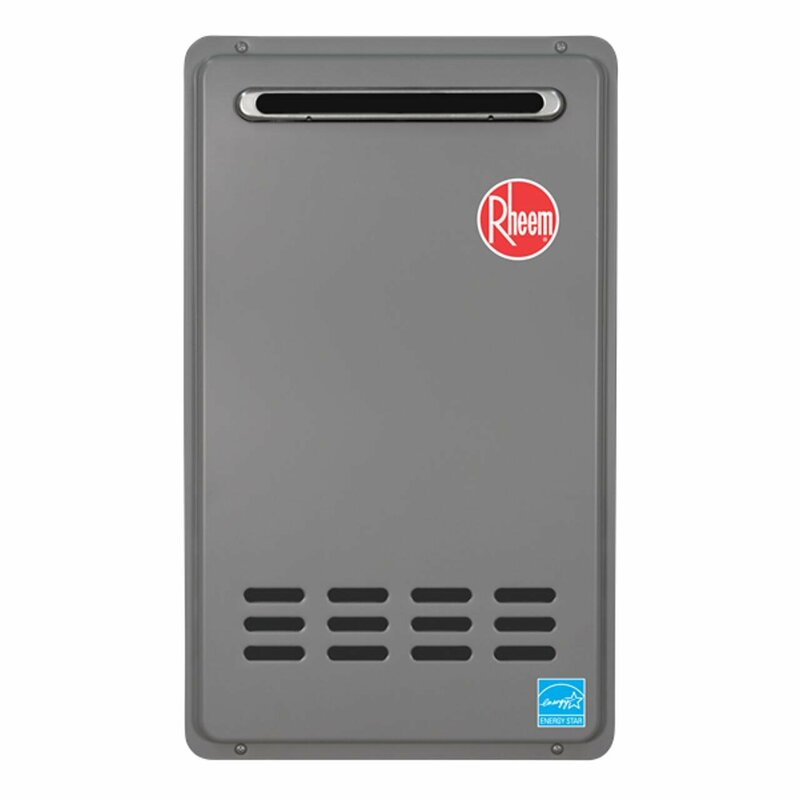 Overall, this Rheem water heater is a good enough water heater suitable for people living alone who do not require too much hot water at the same time. After all, 4 GPM is an adequate enough amount of water to enjoy a refreshing hot bath. It is relatively cheaper compared to other types. It provides hot water when needed. It is not fit for bigger households. The other parts needed for installation may add to the cost. We have discussed in detail the various Rheem tankless water heaters that several other online Rheem hot water heater reviews have praised. Now the question is, is it really time to switch to a tankless water heater? The simple answer is yes. If space is an issue for you and if you are keen on saving on energy costs in the long run, then by all means, get your home a tankless water heater. Tankless water heaters are easy to install, and they are not as complicated to operate. Furthermore, they are packed with advance features that allow for easy monitoring and control. However, the cost of the appliance itself is one consideration you need to keep in mind. It is unfortunately true that most water heaters come at a higher price. But with careful consideration and an informed decision making, you are guaranteed to still get your money’s worth. Eventually, most tankless water heaters prove to be economical in the long run. Over the years, we have seen the water heating industry produce high-quality appliances. And indeed, it is easy to get confused and overwhelmed as to which type to get. One thing to keep in mind when choosing your tankless water heater is your unique needs. You need to determine what you need a tankless water heater for and the specific features you would want to find in a water heater. Also, you have to consider your location—can you install an outdoor water heater? Do you live in snowy and colder areas? Lastly, price is an important factor you need to keep in mind. You need to determine how much you are willing to spend on both the unit itself and the installation cost. We have discussed three excellent water heaters above. As noted, the three water heaters work depending on your specific needs. Now, which type wins in the round up above? We cannot give you a definite answer, unfortunately, since each type is different and serve different needs. But we can guarantee you that each type works best as long as it matches your specific needs. For example, if your household requires a higher hot water flower rate, than the Rheem RTGH-95DVLN unit is for you. However, if price is an issue, you may opt for the Rheem RTG-64XLN unit or the Rheem RTE 13 unit if size is an important consideration for you. We suggest you go through the above Rheem tankless water heater reviews again and carefully decide which one works best for you according to your needs. Do not hesitate to ask experts in case there are components you do not understand as well. Good luck in your search for the best tankless hot water heater.